Like last year, I haven’t read nearly as much YA as I wanted to/should have, due to number of tedious, adult-ing reasons. So here is a leaner, meaner list of my top five best YA reads of 2017. I mean, I could have dragged the list out to ten, but that would have taken away from the absolute awesomeness of these five, utterly top-notch books. Please note that there has been absolutely no attempt to balance this list by age, gender or genre. These are just my “from-the-gut” favorites of the books I read this year. Click on the title to go right to the review. In years past, I have faithfully posted a Top Ten Books list. But this year, I haven’t read nearly as much YA as I wanted to/should have, due to number of tedious reasons, the main one being that I was was supes busy working on many other adult-ish writing/reviewing projects. (Adulting. So boring, yet so necessary. You’ll see what I mean soon enough.) So here is a leaner, meaner list of my top five best YA reads of 2016. I mean, I could have dragged the list out to ten, but that would have taken away from the absolute awesomeness of these five, utterly top-notch books. Please note that there has been absolutely no attempt to balance this list by age, gender or genre. These are just my “from-the-gut” favorites of the books I read this year. (Also, The Underground Railroad was not published as a YA book, but is a book that in my opinion, all YAs should read) Click on the title to go right to the review. Happy holidays, teen peeps! In the better late than never category, here is my top ten list, delivered like a present to your email, Twitter or Pinterest right on December 25th. Please note that there has been absolutely no attempt to balance this list by age, gender or genre. These are just my “from-the-gut” favorites of the books I read this year. (While I love all my Top Ten books the same, I just might love I’LL GIVE YOU THE SUN a tiny bit more:) Click on the title to go right to the review. Carroll, Emily. Through the Woods. Fleming, Candace. The Family Romanov. King, A.S. Glory O’Brien’s History of the Future. Nelson, Marilyn. How I Discovered Poetry. Perkins, Stephanie. Isla and the Happily Ever After. Tamaki, Jillian and Mariko Tamaki. This One Summer. Woodson, Jacqueline. Brown Girl Dreaming. It’s Top Ten time, teen reading peeps! Please note that there has been absolutely no attempt to balance this list by age, gender or genre. These are just my “from-the-gut” favorites of the books I read this year. (While I love all my Top Ten books the same, I just might love BOXERS & SAINTS a tiny bit more:) Click on the title to go right to the review. Dahlquist, Gordon. The Different Girl. Finneyfrock, Karen. The Sweet Revenge of Celia Door. Forman, Gayle. Just One Day. Forman, Gayle. Just One Year. Yang, Gene Luen. Boxers & Saints. Please note that there has been absolutely no attempt to balance this list by age, gender or genre. These are just my “from-the-gut” favorites of the books I read this year. (While I love all my Top Ten books the same, I just might love WHERE THINGS COME BACK a tiny bit more:) Click on the title to go right to the review. King, A.S. Everybody Sees the Ants. Oppel, Kenneth. This Dark Endeavor. Reeve, Philip. A Web of Air. Scieszka, Casey & Steven Weinberg. To Timbuktu: Nine Countries, Two People, One True Story. Stiefvater, Maggie. The Scorpio Races. Taylor, Laini. Daughter of Smoke and Bone. Whaley, John Corey. Where Things Come Back. Yancey, Rick. The Monstrumologist: Isle of Blood. Please note that there has been absolutely no attempt to balance this list by age, gender or genre. These are just my “from-the-gut” favorites of the books I read this year. (While I love all my Top Ten books the same, I just might love BEFORE I FALL a tiny bit more:) Click on the title to go right to the review. Black, Holly & Justine Larbalestier, eds. ZOMBIES VS UNICORNS. Green, John & David Levithan. WILL GRAYSON, WILL GRAYSON. Yancey, Rick. THE MONSTRUMOLOGIST: CURSE OF THE WENDIGO. Please note that there has been absolutely no attempt to balance this list by age, gender or genre. These are just my “from-the-gut” favorites of the books I read this year. 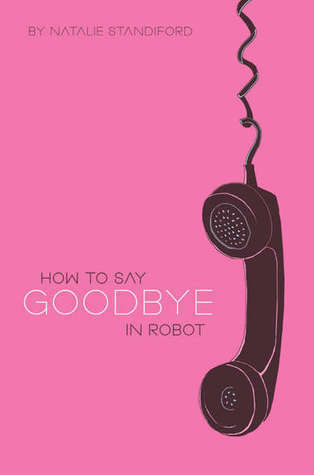 (While I love all my Top Ten books the same, I just might love HOW TO SAY GOODBYE IN ROBOT a tiny bit more:) Click on the title to go right to the review. Kelly, Jacqueline. The Evolution of Calpurnia Tate. Standiford, Natalie. How to Say Goodbye in Robot. Stork, Francisco X. Marcelo in the Real World. Please note that there has been absolutely no attempt to balance this list by age, gender or genre. These are just my “from-the-gut” favorites. Just click on the title to go right to the review. Anderson, M.T. The Astonishing Life of Octavian Nothing, Traitor to the Nation, Vol. II: The Kingdom on the Waves. Lockhart, E. The Disreputable History of Frankie Landau-Banks. Rebeck, Theresa. Three Girls and Their Brother. Reeve, Philip. Here Lies Arthur. Please note that there has been absolutely no attempt to balance this list by age, gender or genre. These are just my “from-the-gut” favorites. No annotations this year, just click on the title to go right to the review. Brande, Robin. Evolution, Me & Other Freaks of Nature. Cameron, Peter. Someday This Pain Will Be Useful to You. Downham, Jenny. Before I Die. Ellis, Ann Dee. This is What I Did. Juby, Susan. Another Kind of Cowboy. Schmidt, Gary D. The Wednesday Wars. Please note that there has been absolutely no attempt to balance this list by age, gender or genre. These are just my “from-the-gut” favorites. You can find longer reviews for most of these titles by searching the site. Happy reading! Anderson, M.T. The Astonishing Life of Octavian Nothing, Traitor to the Nation, Vol. 1: The Pox Party. (8th-12th grade)After a young man slowly realizes that he and his mother, an African queen, are the subjects of an extensive social science experiment in pre-Revolutionary America, he takes drastic steps to save them both from a life of slavery and servitude. Winner of the 2006 National Book Award for Young People. Sixteen-year-old Ivy learns some disturbing family secrets after she discovers a taxidermied body in the basement that could be her paternal grandmother. In an ultra-safe future, where contact sports and name-calling have been outlawed, teenaged Bo breaks the rules and ends up in a penal pizza-making factory, where he ironically learns the true meaning of freedom. Evan begins to realize that he’s not alone in his new room when he begins to have disturbing dreams of a girl from the past who’s in trouble. This nostalgic historical fiction of a boy and his devoted dog who manage to stay together against overwhelming odds, will remind teen readers of Stephen King’s Stand By Me, or S.E. Hinton’s The Outsiders. Eleven-year-old Jake only likes football and fish, until eccentric, outspoken Stella comes into his life and changes it forever. When an asteroid hits the moon, causing worldwide natural disasters, small-town girl Miranda must give up all the things she used to take for granted, like electricity, clean laundry, and chocolate. My personal favorite book of 2006. Good girl Audrey’s life goes into a downward spiral when a vindictive friend mass-emails a cell-phone photo of Audrey doing something not-so-nice with a boy at a party. This disturbing and sad graphic novel for grown-ups about a pride of lions that escaped from the Baghdad zoo during an American bombing raid of Iraq makes a powerful statement the meaning of freedom that will resonate with older teens. This brightly colored, charismatic graphic novel, about a young middle school student’s struggle to become comfortable with his racial identity, is rich in wisdom and folklore, and ripe with humor and pop culture references. Nominated for the 2006 National Book Award for Young People. Winner of the 2006 Michael L. Printz award.